Where do I use my Dominos voucher code? Follow our link to the Dominos website. Choose your base, size and pizza toppings next add any sides, drinks, and desserts, then view your order summary. Enter your discount code into the voucher box underneath the order summary and click apply. Your discount will be automatically applied to your order. Continue with your order process as normal and save some money on your pizza. "If you sign up to the Domino's email newsletter you'll receive details of new promotions direct to your inbox." "Follow Domino’s on Facebook and receive word of all the latest pizza launches in addition to exclusive deals." "If you’re not committed to eating at Domino's, see our Pizza Hut and Papa John's pages, where you may find a better active pizza deal." Whether it’s a family night in front of the couch, a party with friends, a quiet weekend in or even date night, Domino’s is the place to go for a delicious takeaway that’s fast, affordable and always up to scratch. With so many deals and offers available, finding the perfect feast for an affordable price is easy at Domino’s, and with so much to choose from, you are guaranteed to enjoy every bite of your favourite pizza. Browse the menu and select from a range of traditional, or more exotic toppings and bases, including pepperoni, Chipotle Pulled Pork, Texas BBQ, Veggie Supreme, Hawaiian, Meteor or classic Margarita with garlic and herb dip. If nothing on the menu takes your fancy you can always customise your own pizza. Handpick from a selection of bases, crusts, sauces, and toppings, or go half and half and enjoy the taste of two pizzas in one! Whether it’s a bbq base, stuffed crust, a meat filled pizza or a simple tomato and cheese topping, you can find it all on Dominos’ insanely delicious, extensive menu, that caters for even the most obscure hunger cravings. And it’s not just pizzas either. Shop from a range of tasty sides and extras like potato wedges, garlic bread and twisted dough balls with cheese, as well as a selection of drinks and delicious desserts, including the infamous Domino's chocolate chip cookies. There’s nothing more torturous than waiting for your takeaway to be delivered, especially when it’s a mouth watering banquet from Dominos. To help with your impatience, Domino’s have created the handy personal pizza tracker, available online and via the mobile app, giving you the power to follow your pizza’s journey from dough to door! With the pizza tracker, you can anticipate the arrival of your pizza to make the waiting just a little bit easier. See when your pizza is being prepared, baked, boxed and when it’s finally on the way to your house with comforting updates that’ll keep you reassured that you won’t be left hungry for much longer. Order online to enjoy the personal pizza tracker, or make things even easier by download the Domino’s App onto your device via iOS or Android today. Feeding the whole family or ordering in on a budget can be hard, which is why Domino’s offer a plethora of deals and offers to ensure that everyone- from families of four to students- can enjoy the taste of Dominos. Choose from many weekday and weekend offers like 30% off a £25 online Order, buy 1 get 1 free, 2 for 1 on Two for Tuesdays and Feed Four for £5 each. Select your chosen offer online, or enter the allocated discount code at the checkout to redeem your money saving discount. As well as these ongoing deals, Domino’s also reward you with 'one off' deals that last a limited time only, to make sure you don’t miss out on these sign up to the Domino’s newsletter for regular text alerts and emails. Domino's delivery is included in your order. If your nearest Domino’s store doesn't offer delivery you can always choose to collect your pizza instead. If there's a problem with your order you can call your local Domino’s branch. Most Domino's stores open between 10am - 11am every day of the week. Most Domino's close between 10pm - midnight, Monday to Sunday. This does vary from store to store, so find local Domino’s store and check the opening times using the Store Locator. For decades now, Domino’s have been a family favourite; baking and delivering fresh pizzas straight to your door every night of the week. Over the years, Domino’s have developed their ever expanding menu to include not only classic pizzas but more obscure ones to, offering every taste and flavour from margarita to American Hot. Whatever size or type of pizza you want you can find it at Domino’s, alongside an array of tasty extras, sides, and desserts. Select your base, size, flavours, and crust and create your perfect pizza for an affordable price. 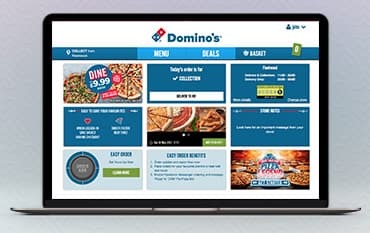 Browse the selection of offers and deals available at Domino’s and make your order even more affordable, or shop with a Dominos voucher code and slice down the price of your pizza even further. We are constantly on the hunt for first order Voucher Codes for Dominos to help you with your money saving. Our experts check dozens of sites for secret codes including NHS discounts, student sites & social media channels saving you time & money!